Vertical gardens hang on the walls and look like hedges but never touch the ground — what Harvard calls green walls. 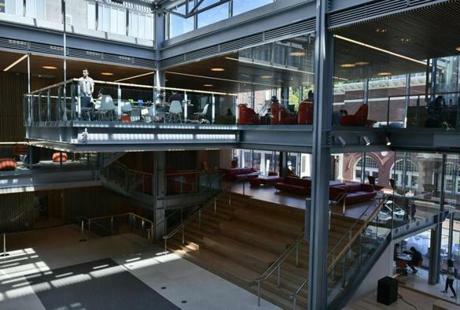 CAMBRIDGE — Harvard’s most interesting building in years is the Smith Campus Center, in Harvard Square. The center is a stab at what one suspects Harvard is thinking of as the future of higher education, especially in connection with the ways that the public world of the city and the private domain of the academy can usefully merge. The Smith Campus Center is a sort of new building inserted in an older one. A two-year renovation project transformed three stories of Harvard’s Holyoke Center, a building of the 1960s that has been renamed. 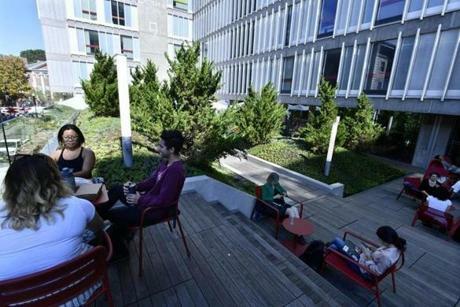 You arrive as you always did at Holyoke, perhaps heading for an outdoor coffee in Forbes Plaza, the popular tree-studded entry space. The plaza’s chess players are back, too, praising their new chairs. The old Holyoke Center was full of ingenious and thoughtful architectural ideas. But few people loved it. Seen from outside, it was a hulking 10-story box of gray concrete. Inside, you navigated a rather noir pedestrian street, a so-called arcade lined with shops that never seemed to thrive. The simplest way to describe the new interior is to say that Harvard has set off a spatial explosion that has blown every element high and wide. The former arcade is doubled in height and now opens in every direction to other spaces that sometimes open to further spaces beyond them, as if we were in an infinite setting by Borges. But you never lose touch with the city outdoors as your near neighbor, because you can see it looking back at you through so many glass walls and windows. Pedestrian bridges span the space and lead you to roof terraces. 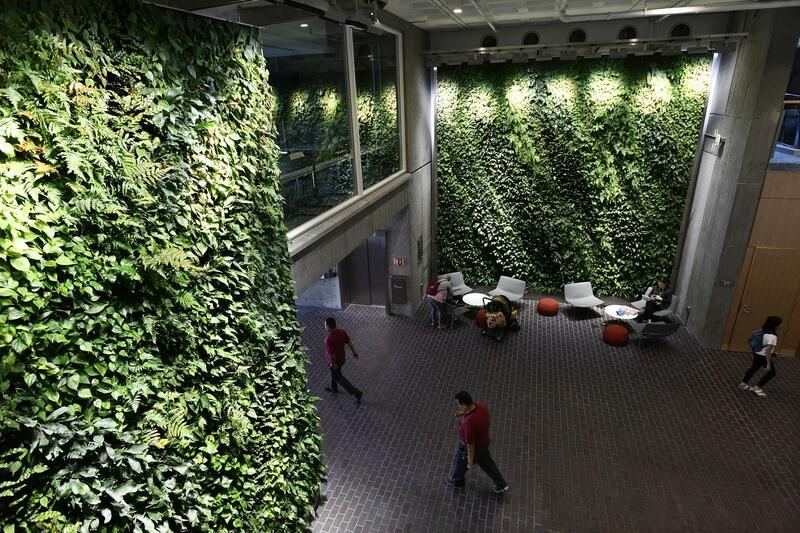 Most amazing are what Harvard calls the “green walls”: vertical gardens that hang on the walls and look like hedges but never touch the ground. You wander freely as if you were in an urban landscape rather than an enclosed interior. A cantilevered seating area is part of the former Holyoke Center at Harvard. The Smith center, officially unveiled Sept. 20, is the latest exemplar of what Harvard calls its Common Spaces program, a series of moves in recent years to pull people out of all kinds of private spaces — clubs, dorms, single-subject teaching spaces — to a common Harvard downtown, a sort of European town square where academics and citizens of all kinds will encounter one another and hopefully mix, meet, eat, shop, and exchange ideas. Setting out garden chairs in Harvard Yard in 2009, for example, was an early move in that direction. In the Smith center, much of the new multilevel interior is thought of as a single gathering place called the Commons, described as Harvard’s informal “living room,” which is open to the public. The center doesn’t have what architects call a program, a list of different rooms for different purposes. Many spaces can be taken over for all kinds of purposes. Walking around, I began to think of it as a multistage theater, the scripts for which have yet to be written. An office of Common Spaces (I love the Orwellian ring of that name) will sort out potential users. If you ask about other goals, you get interesting answers. You’re told, for instance, that Harvard needed a flagship, a kind of rallying point, because strangers — tourists, parents, prospective students — would come, gaze around in bewilderment, and ask, “Where is Harvard?” Needed was a place where they could anchor and orient themselves at the center of the campus. The Smith center is “a front door to the university,” says Harvard, offering a raft of services such as the Harvard Information Center, with its rich historic materials. Harvard, of course, doesn’t have a campus — the Yard is more like an enclosed cloister — so the title Campus Center is a case of word replacing deed, never a complete surprise in the world of Veritas. Harvard also talks of the rising tide of student activities that need someplace to meet and organize. Cheap space for that kind of hanging out used to be plentiful but is rare in today’s pricey Cambridge and environs. Older grads can recall a time when there were three all-night cafeterias in Harvard Square where, for the price of an English muffin and tea, you could argue about Ingmar Bergman till dawn. A rooftop garden fills a second floor balcony overlooking Dunster Street. The Smith center is worth studying as a fully contemporary building that has neither forgotten nor imitated the past. It’s just a short distance from the old dorms of Harvard Yard, which seem to be wrapping their brick coats and tiny windows tight against the winter wind. The Smith center turns that language inside out with its walls of glass, walls that pretend no walls exist. Each kind of building is an opposite of the other, a visual icon, you could say, in a debate about weather. The past is present, too, in a literal way. Muscular rough-surfaced concrete columns stand where they’ve always stood, still doing their job. They haven’t been hidden, but they haven’t been celebrated, as they might be today, as cute historic decor. Names in art and architecture are often silly, but rarely miss the point. The usual word for the style of the old Holyoke Center is Brutalism. Josep Lluis Sert was dean of the Harvard Graduate School of Design from 1953 to 1969. Besides Holyoke, he designed Harvard’s Science Center and Peabody Terrace, a residential complex. He gets tagged with the Brutalist moniker largely because of his love of concrete. Brutalism is a longer story, but it’s fun to be able to spot it in the Holyoke columns. They remind us the building has literal roots in the past as well as ideas for the future. The principal architect for the Smith center was Andrew Barnett of the British firm Hopkins Architects, working in tandem with the Cambridge firm Bruner/Cott Architects. The latter has become something of a specialist in the tricky art of maintaining the concrete in Boston’s Brutalist-era buildings. A couple of gripes: The glass is superb in the ways it opens visual connections. But glass walls and the whole concept of endless transparency are cliches today in the world of commercial office buildings. The Smith center’s architecture sometimes, perhaps unfairly, has a look that’s a shade more corporate than it needs to be. And while there are food vendors inside, the building has been stripped of the sidewalk shops that lined its two side streets, Dunster and Holyoke. Asked why, architect Barnett argues the shops blocked the view from inside out to the city. Wasn’t it a Russian czar who wiped out a peasant village that was messing up his view? At the Smith center, the shopless street facades are flat and lifeless. No doubt Harvard will plant trees. 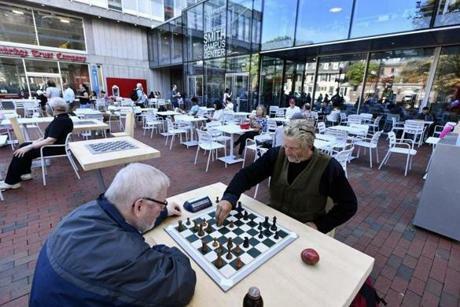 Chess players, a fixture in front of the old Holyoke Center, have returned to the plaza now that the transformed complex has reopened as the Smith Campus Center. These are minor flaws in the context of an adventurous, thoughtful piece of architecture. A university, someone once said, has two major missions: It must remember the past and invent the future. The Smith Campus Center tries to do both.